Mum made this its OK. Like it doesn’t taste bad or anything but I wouldn’t eat it again. I just like things to taste more fresh. I love beef stroganoff and always made it from scratch. However, since I found Continental Recipe Base Beef Stroganoff, I am a definite convert. The flavours are rich and delicious, and so easy and doesn’t take long at all for me to enjoy my comfort food. Sorry not a fan. It really didn’t taste as nice as I thought it would. It was okay I guess but not something I’d buy again. This was very easy to make, but we don’t really like this version of stroganoff. It is too creamy and really not a very apetising colour. Won’t buy again. 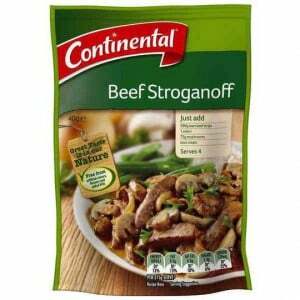 How would you rate Continental Recipe Base Beef Stroganoff?